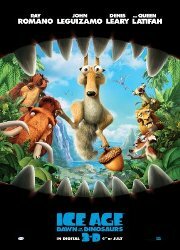 The zany ice-age crew are back for yet another adventure. This one has a main plotline and several subplots. They discover a hidden world beneath the ice, where dinosaurs still roam, and danger is everywhere. Sid gets broody and kidnaps some dinosaur eggs to raise as his kids, but mama dinosaur does not like that idea. Inbetween, Manny and his wife are expecting a little mammoth, and the squirrel may have found true love... even if it costs him his acorn. This film is releasing in both 2D and 3D, this is the 2D version. Adventure, Animals, Animated, Comedy, Family, Kids. Comments Largely comic animation but there are moderately menacing moments and episodes and parental guidance is advised.